Many residents name safety their number one consideration when choosing a senior living community. One way to provide a feeling of well-being for your residents or prospective residents is to integrate a fire safety system with your PalatiumCare nurse call system. Some facilities already use a fire panel to monitor their resident rooms and common areas. PAL|FIRE is the PalatiumCare interface that allows messages from your fire panel to be sent directly to your staff. This allows caregivers, maintenance workers, and security personnel to respond quickly and efficiently to fire-related emergencies. If your facility is not required to have a fire panel, then you can address safety concerns with Inovonics® Smoke Detectors designed to work with your PalatiumCare nurse call system. 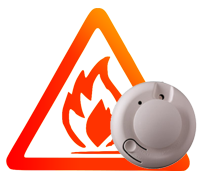 To learn more about the fire safety features of PAL|FIRE, contact a sales representative.